Why Zambia? A Primer on the Fourth Meeting of State Parties in Lusaka. After a long absence from this space, I’ve finally returned with my second blog post. In exchange for my regretted silence, my readership will be able to gain some insight into the motivation behind my Zambian stay. In this week’s post, I’ll also provide background on the history of the Cluster Munition Convention in addition to a short glimpse of life in this fascinating city. So what exactly am I doing in Southern Africa? I have been dispatched to Zambia to help set the ground for the 4th Meeting of State Parties (4MSP) to the Cluster Munition Convention, a diplomatic conference that will negotiate, discuss, and update global efforts in reaching a comprehensive ban on cluster munitions. Entering its fourth year, the Cluster Munition Convention marks another major breakthrough for efforts of disarmament in the arena of international conflict. Cluster munitions can be best understood as large bombs that transform into dozens of smaller submunitions when dropped through the air. They have been particularly fatal in recent conflicts, including the ongoing Syrian war, where they have contributed to scores of casualties. Much like anti-personnel landmines, cluster munitions have a disproportionate impact on non-combatants living within war zones. As a number of studies and analyses have shown, clusters have little military utility and are not effective in conventional warfare. 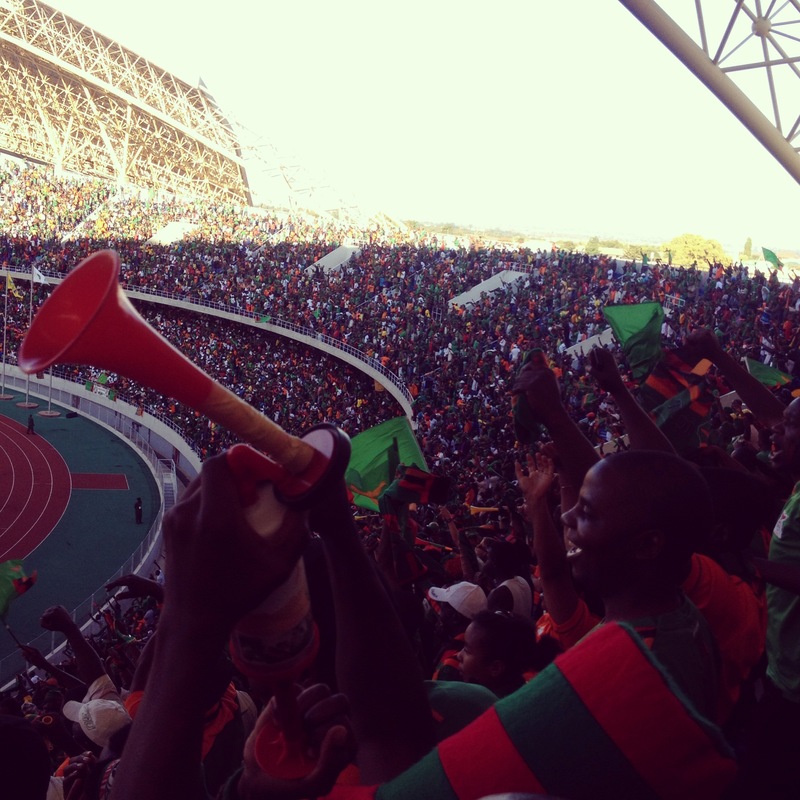 But yes I know, the question remains…why Zambia? Although Zambia has had little incidence of armed conflict throughout its history and is widely regarded as a bastion of stability in the region, it did have limited incidence of cluster munition contamination. As a host of numerous regional liberation movements including the ANC and FRELIMO, Zambian territory was the target of armed operations headed by opposed colonial authorities and the South African apartheid-era regime. These incidents included the use of cluster munitions in the South African case, which were recently successfully cleared. 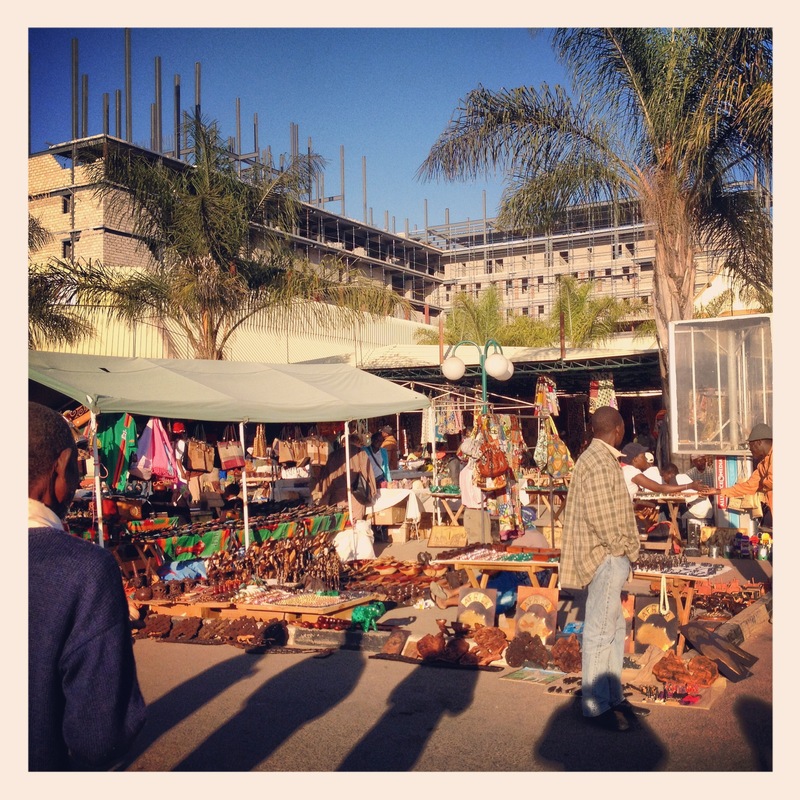 Lively Sunday Market in Lusaka. In addition to its limited exposure to cluster munitions, a key motivation in Zambia’s willingness to host the Meeting of State Parties is in it’s ambition to become a regional leader in the area of security. Africa has been notable in its nearly universal adoption of the convention, with more ratifications than any other continent in the world. In light of this breakthrough and as an early adopter of the Cluster Munition Convention, Zambia serves as a fitting host with capacity for a conference of this scale. Lusaka, the site of the meeting, is a sprawling lively metropolis of over 3 million people. As the largest urban settlement in Zambia, it has long served as an economic draw for people all over the country, far and wide. Contemporarily, Lusaka is in the midst of rapid urban development with its fast changing landscape beginning to be dominated by large modern shopping complexes and structures. Despite this frenzy of construction, the city continues to retain a unique flair, best highlighted by its blue, noisy traffic defying minibuses. The renowned Zambian spirit of inclusiveness and generosity is abundantly on display throughout Lusaka and will help provide a cheerful backdrop for conference participants. 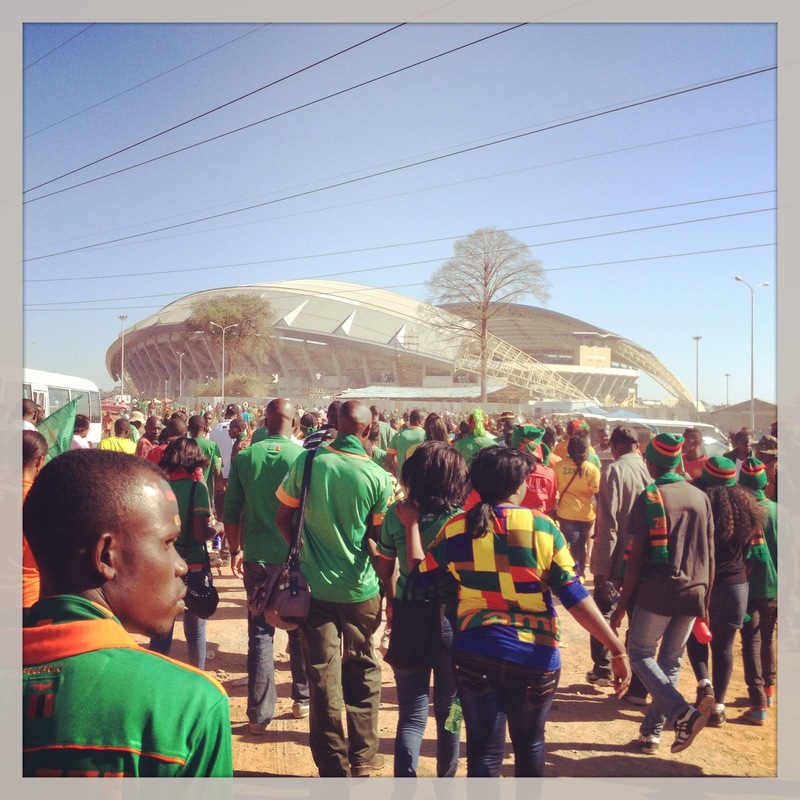 Chipolopolo supporters stream into the stadium in the lead up to the match. I remember once reading that the demilitarized zone between North and South Korea had one of the most well-preserved ecosystems and strongest biodiversity in the entire world. Not because it is protected by treaties or because either country has some particular soft spot for the environment, but because humans have not entered the area in half a century: it is one of the most heavily landmined areas of the world. I don’t know how pristine this environment necessarily is as we learn more about the long-term effects of explosives in topsoils and leeching into water tables, but the point is, that with the absence of humans the forest along this 250km stretch of land spanning the peninsula has been protected as a peculiar byproduct of war. 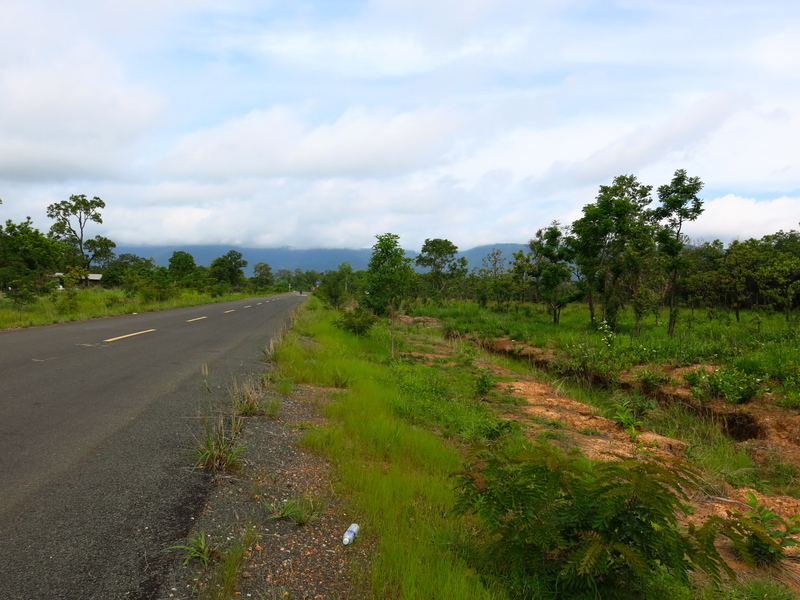 I was thinking about this last week as I drove through the remote northern province of Preah Vihear in Cambodia. We were delivering 5 pairs of crutches to previously identified people with disability (PWD) for Handicap International. Preah Vihear province is about 200 km from Siem Reap, but feels much further (especially when our average speed is about 50km/hr). It is one of the poorest of Cambodia’s 24 provinces, and in the latest records from the Cambodia Mine Action Authority, the province has had the third highest number of recorded landmine casualties annually for the last 2 years. Preah Vihear is also a beautiful place. As we drove through, I realized I was seeing what I always sort of expected Cambodia was ‘supposed’ to look like before my first visit 4 years ago: rolling green hills, low mountains in the distance, forest with ancient trees towering above the pockets of quiet farms with small wooden houses perched on stilts that survey pumpkin vines, corn, banana trees, and sugar palms. But far too often we would emerge from thinning forest to see half a hillside dry and barren, and covered in low burned stumps. Some lucky tree would stand lonely in the middle of this new field, where the military was cheerfully building a dozen or so identical new houses. You can spot the military areas because the metal roofs are painted camouflage green – Thailand’s 2011 cluster bomb assault is still fresh in everyone’s memory. As we drove further north away from the villages toward the border, the forest became thicker and the few residences scarcer. “Only military can live here,” my coworker Reth explained to me from the front seat of the car, as we passed a solitary man in fatigues on a motorbike. “Is the area not safe for civilians?” I asked him. Rule #1, I repeated to myself, thinking of my week in pre-departure briefings with MAC in Ottawa, Don’t step off the path. Later, when I was lucky enough to catch a motorbike ride up the mountain with a soldier to visit the mountain temple, I stood at the edge of the cliff taking in the spectacular view. 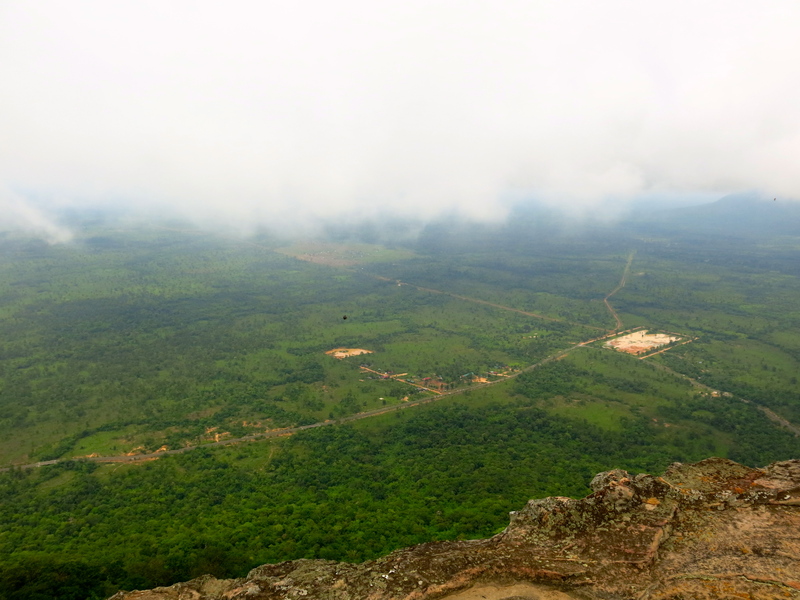 Cambodia was stretched out before me, land we’d spent hours driving over looking green and small far below. You’d never know it was the most dangerous part of the country, packed full of cluster munitions and probably landmines. It was also intensely green. The horizon was hidden in cloud, but I realized that if I could see farther, the forest would soon give way to bare fields and empty rice paddies. If I could magically see beyond this, I might be able to glimpse some of the bare, burned land in the southeast of the country, where protected forest is being logged illegally for valuable hardwoods. Or I might be able to see Kampong Cham province and the acres and acres of neatly planted rubber trees, bare of undergrowth and wildlife. Or across the empty southwest, the factories that stretch further from Phnom Penh all the time. But in the land closest to me, there was no one, and it was green, and it was bombed. A few weeks ago I was enthusiastically telling a friend of mine here in Siem Reap about the size of recently demined land (because I’m a nerd, obviously), forgetting that she is a primatologist who works in conservation just outside the town. “Don’t tell me!” she interrupted, only half-joking, “As soon as it’s clear the forest gets torn down!” Economic prosperity is something Cambodia is working hard on. The problem is, it’s often to the detriment of the environment. And my friend is right – because as carefully as demining groups are able to clear land of mines, clusters, and other ERWs, it’s immediately turned over to the government, that immediately decides to use it for industry. 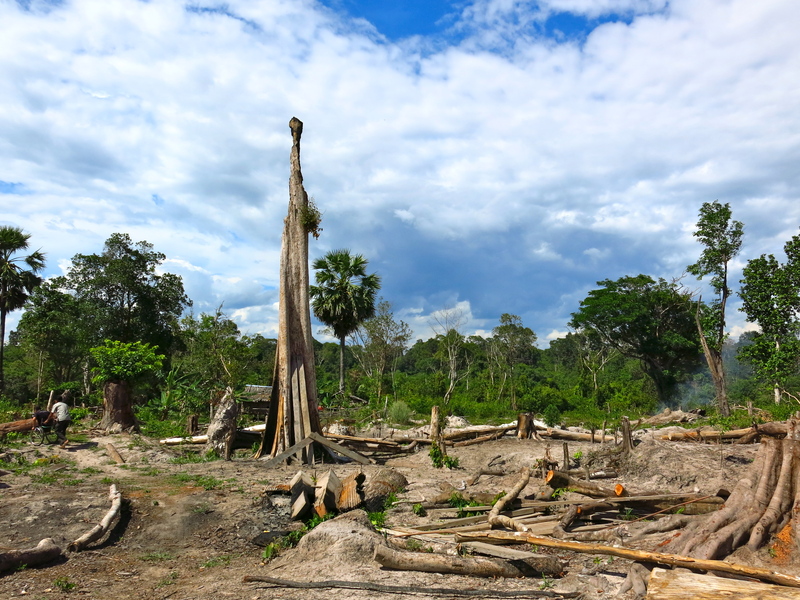 And this means that in addition to the many, many human rights issues Cambodia faces (like poverty, malnourishment, labour rights, land titles, gender equality, and disability, to name a few), it also faces a massive environmental problem: deforestation. As the forest recedes, the delicate ecosystems of Cambodia are affected: water tables change level, wildlife populations disappear, and flash flooding drastically effects peoples lives. People who previously relied on the forest for food or labour (carefully, though they risk encountering mines) go hungry as their extra sources of greens and protein disappear. The land I was looking over as I stood at the top of Prasat Preah Vihear, at the very northern tip of Cambodia was probably the most well protected ecosystem in the country. And it’s not because it is protected by a park, it is because it’s too damn dangerous for anyone to enter. I’m not suggesting that mine action is directly contributing to deforestation and the rapid deterioration of the environment in Cambodia. But what I am saying is that we can’t ignore the gap between human rights and environmental rights. 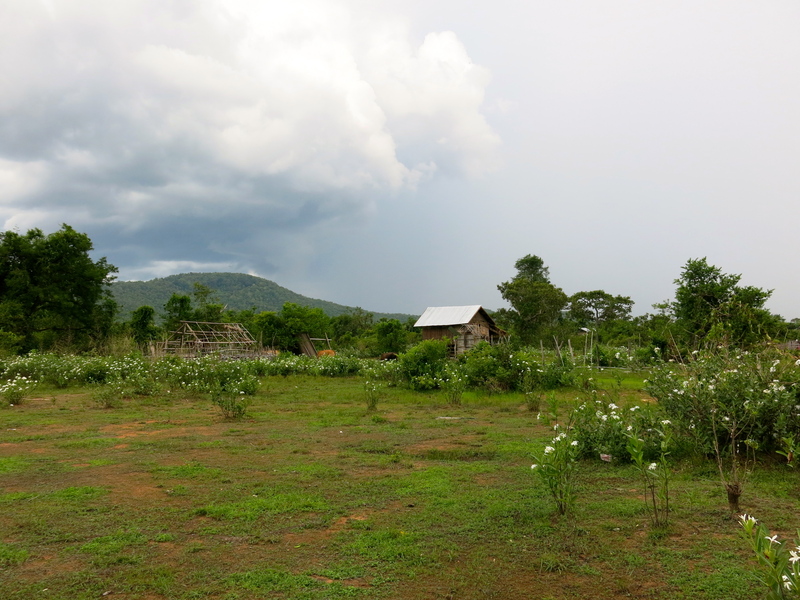 The problem with humanitarian mine action in Cambodia is that land isn’t exactly returned to families it originally belonged to – land titling records were lost or destroyed during the Khmer Rouge regime, and few people now in rural areas actually own the land they live on. Rather the demined land is released to government, to do with it as it sees fit: which is usually making the best use of it economically, and that rarely includes giving it to a family that intends to grow a few banana trees and have a rice paddy. The only responsibility governments have to the Mine Ban Treaty in regards to clearance are just that: to get the mines out of the ground and return it to productive use. The Mine Ban Treaty isn’t about environmental rights, it can’t be: it has to focus on the prohibition of the weapon in order to be effective (and it is effective, in this way), and it can hardly start meandering its way into how governments are supposed to use the cleared land after. But I think there is a responsibility of governments to consider what happens when they scoop up decontaminated land and throw a rubber plantation or a sugar cane plantation or a factory on it. In May, the Landmine & Cluster Munition Monitor reported that Cambodia cleared and released a total of 71.46 km2 of land in 2012. In March, the Cambodian Baseline Survey (completed by the CMAA) identified there was still 1,071.8 km2 of land contaminated by landmines, cluster munitions, and other explosive remnants of war. If we keep up the current rate of clearance, Cambodia has about 15 more years of demining before it can declare itself landmine free. That gives us some time to find a land release strategy that takes into consideration Cambodia’s economic prosperity, the land rights of residents, and the protection of the ancient forests that are the key to maintaining a healthy ecosystem and biodiversity. Let’s get started. April 4, bicycles, and other thoughts. If you bicycle south along the river that cuts through the centre of Siem Reap, it winds its way slowly down to the Tonle Sap lake, about 14km away. You know when you’re approaching the lake because the foliage fades away to expose flat, wide rice paddies and a single hill rising above the countryside – the temple hill of Phnom Krom. This time of year, the lake has receded far from its usual shores and is much smaller than it is during the heights of rainy season. 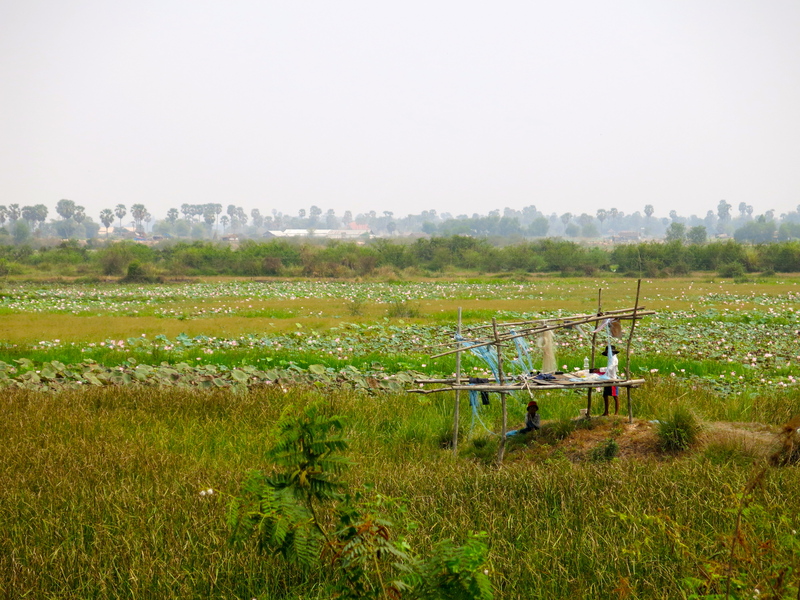 Instead of rice, there are pink lotus flowers dotting the flat landscape, and the houses rise on stilts to perch high above the ground, ready for the inevitable flood of rainy season when the lake expands – this could begin any time between about April and June. 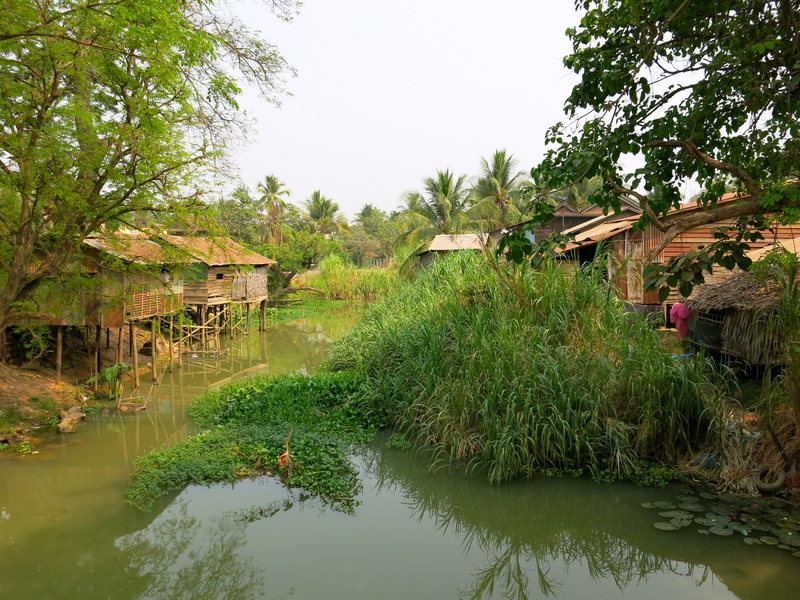 At the bottoms of some of the stilt houses and schools and restaurants lie crooked buildings, built on hollow barrels and sealed piping – designed to float on the lake during rainy season. In fact, if you take a boat out to the centre of the lake you will come across these floating villages, nestled between drowning trees. I took a bike ride Sunday morning down to the shore in an effort to escape the heat and dust of the town, but these things are impossible to leave behind. I made it there and back before noon, but was drenched in sweat by the time I returned, and had gone through a litre of water that started a frozen lump in my bag and ended an opposite-of-refreshing lukewarm. But, it was nice to get out of the urban congestion of town, especially after I spent much of the week in Phnom Penh, which was even dustier and hotter. I was invited to Phnom Penh by Sister Denise who brought me to the National Conference on Mine Action, which the government organized in advance of International Day for Mine Awareness. Phnom Penh is a 5-6 hour drive (about 300 km) southeast of Siem Reap, following the very Tonle Sap Lake I visited on my bicycle. The National Conference took place in the Peace Palace, which also houses the Prime Minister’s office, and is a huge, new building overlooking the dustbowl that was once Boeung Kak lake in the northern part of the city. As you look out the windows of the air-conditioned, chandeliered palace, you can see the dilapidated shacks and homes around the edge of the dry lake. It’s a stark contrast to the reality of poverty in Cambodia. The conference itself was an interesting event, highlighting Cambodia’s work in mine action and victim assistance, and I learned better how the different government ministries work, as well as meeting a number of representatives from various NGOs working in the sector, including Handicap International, and Norwegian People’s Aid, who I wanted to track down anyway because I really want to have a look at their mine-detecting dogs (they told me to give them a call later and I could come by sometime for a visit). At the end of the conference, Sister Denise stood up and urged Cambodia to join the Convention on Cluster Munitions, which had been barely referred to throughout the entirety of the day. However later, in the Prime Minister’s speech, there was a hint of why this had been left out: he mentioned the weapons trial of BM-21s the day before. It was odd, and perhaps poor timing for a military practice, right before a national conference on the damage done by ERWs – especially as the weapons being tested can be used to fire cluster munitions. I could feel some disbelief in the room at the casualness of this remark, but the PM maintained that he, like the commander of any army, has every right to engage in weapons practice. And so he does. The biggest issue facing mine action in Cambodia is lack of funding, which a number of organizations and ministries requested change. The reliance upon NGOs in the country is huge, especially in survivor assistance, and slowly these NGOs plan on withdrawing their services – HI Federation, the ICRC, Veterans International, and the Cambodia Trust run the majority of the 11 rehabilitation centres in the country that specifically provide services to survivors and generally people with disabilities. As they are slowly, over the next few years, planning to withdraw their operations in an effort to have the government take more responsibility, there is serious concern that the quality of these services drastically decrease. Everyone’s reasoning for the lack of funding and the lack of continued programming is a decrease in the number of landmine accidents every year in Cambodia. This is true – accidents are fewer and fewer every year. However, few seem to remember that this doesn’t affect the number of people who have already had an accident with an ERW in the past, and are now living with the consequences. Just because there are fewer accidents, that does not magically make the people living with disability disappear. They’re the one who require the long-term, sustainable programming and services. But then, it’s always frustrating when governments and NGOs fail to have long-term plans, and that is the nature of how they work. We have to just keep pulling through, and raising awareness, and be more creative in our approaches to sustainable development, where sustainability and rights-based approaches are key. Which brings me to the end of this post, with a reflection about International Day for Mine Awareness on April 4. 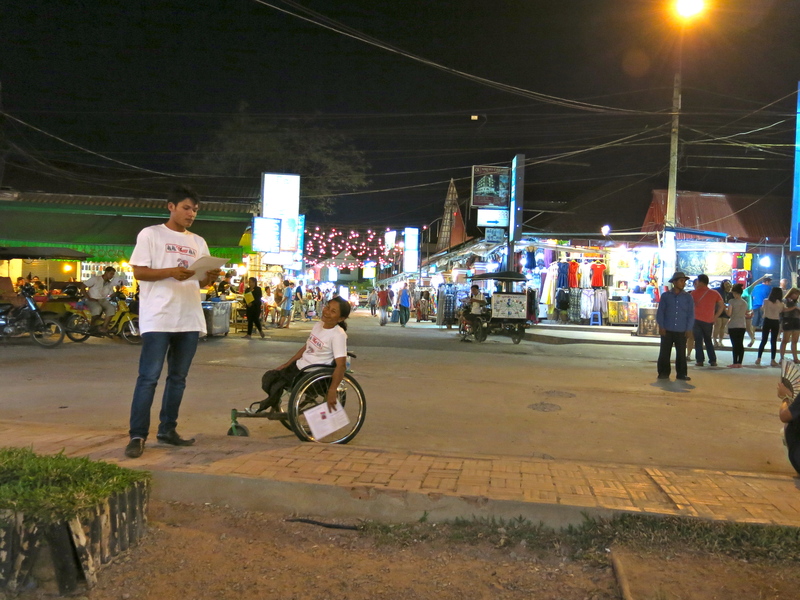 It was the day that I returned to Siem Reap from Phnom Penh, and the whole team from JRS headed down to Pub Street in town to give out flyers about mine awareness. They’re such wonderful people, and many of them are living proof that survivors don’t disappear – they continue their lives and fight for their rights and are hilarious and clever and kind and don’t give up, in the face of everything else. They inspire me every day that I’m here.